It is a common dilemma for most parents: what school do I choose for my child? There are open houses for elementary and high schools, CEGEPs and universities, the feverish devouring of information flyers, surfing the internet and endless phone calls. Public or private? Canada or the USA? Entrance exams and scholarship opportunities. There is so much to consider. Finding an expert in this field who will be objective and helpful at the same time is no easy task. Marla Pinsler is well aware of this. The Côte Saint-Luc District 2 resident and mom of a primary school student herself, she has spent the past 25 years in individual, family, career and university counselling and worked at several of the most renowned preparatory schools in Canada. Her time at Havergal College and St. Clement’s School in Toronto & Miss Edgar’s & Miss Cramp’s School (ECS) here helped her gain the invaluable experience and knowledge required to help others navigate the college application process with ease, responsibility and control. Pinsler’s knowledge of the Canadian, British, and U.S university systems makes her a logical choice to help make life challenging decisions. Let’s back up a bit. Pinsler grew up in CSL and attended United Talmud Torahs (when it was in the present-day Merton School building in CSL), Bialik High School and Vanier College. She enrolled at Concordia University and obtained her Bachelor of Arts Degree in Applied Social Sciences, moving on to earn her Master’s in Education Counselling Psychology at McGill. Bialik turned out to be her landing spot for her initial placement, followed by work at Ometz and Herzliah for two years. She signed on to ECS as a guidance counsellor and after four years and at the age of 30 she made the difficult decision to relocate to Toronto. Her sister was there and her niece was two years old at the time. Getting a job at one of the country’s top girls schools, Havergal College, did not hurt either. She stayed there for 14 years, became a mom to her beloved son Andrew, and had a chance to fly across the continent to different colleges and universities. As well, she benefitted from extensive professional development. So with that in mind, Pinsler launched her own company. She still works part-time in the education sector, but the demand for her private consulting services seem to grow each day. Clients lean on her expertise in the areas of: college search and finalized application list; essay brainstorming and editing, resume building, transcript analysis, course selection, scholarship info, interview strategies, college tours, academic coaching, personal counselling and the MMIs (Multiple Mini-Interviews) for Medical School Admission. Pinsler made headlines recently when the college admissions scandal in the United States surfaced and it was learned that wealthy celebrities were buying admissions into top universities for their children. Here is a story on Pinsler by Bill Brownstein of The Gazette . Marla Pinsler with Global TV's Laura Casella. Pinsler was also interviewed here on Global TV. You can go to http://www.marlapinsler.com for more. A group of newcomers to Quebec will be hitting the slopes for the first time. About 40 of them, many from much warmer climates, will be at the Chantecler ski resort in the Laurentians on Saturday to try out skiing. The event is being put on by OuiCanSki, an organization that introduces immigrants to skiing to help them embrace Quebec winters. Sandy Wolofsky, a sports agent for amateur athletes and a former competitive skier, founded OuiCanSki last year, after reflecting on how her immigrant grandparents learned to be Canadian by skiing on Mount Royal. 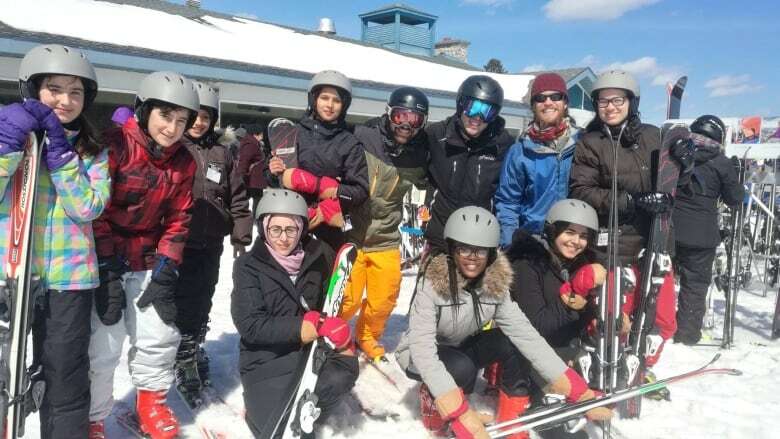 Wolofsky turned to two Montreal immigrant-support organizations, CACI and Ometz, to connect with newcomers to organize a day on the slopes. They all get lift tickets, ski rentals and a two-hour lesson. Wolofsky spoke to All in a Weekend host Sonali Karnick. Why did you take on this kind of project? My mother's parents, when they came here, they wanted to be Canadian and one of the things they did to become Canadian was they went to Mount Royal and they learned how to ski. I have video from the 1940s of my grandparents skiing on Mount Royal with my mother and my uncle. When I was born, my mother put me on skis by the time I was one-and-a-half years old. So, I've always wanted to somehow honour my grandparents and thank them for doing all the work that has allowed me and my brothers and my cousins to have this wonderful life in Canada. Where did you find the people to go on these trips? Last year I met someone who was involved with an organization called CACI, which is based out of Cartierville and she introduced me to people out there and they were my first group. After that was so successful, I met people in Côte-des-Neiges and Côte Saint-Luc who said to me, 'Wait, how come you haven't been to Ometz?' So … we started working together to have an Ometz day. What is it like for people from hot countries to learn how to ski? Last year, we had 42 people from 13 different countries, most of them from the African continent. There were people from Cameroon there were people from Guinea, there were people … from all over the place. It was an amazing sight to see because clearly they were not all that comfortable with a lot of snow and they certainly were not comfortable on skis but they were smiling so it didn't matter how often they fell. I have a whole bunch of organizations that have approached me and expressed interest. But right now I'm one person trying to figure this all out bit by bit. So far, actually, I don't have any money, so it's really been off the goodness of a lot of people who've been helping me. Parks and recreation was not a television show for Harold Cammy, but a calling that became a profession that he practised with distinction. At the end of December, Cammy retired as sports manager of Côte-St-Luc’s parks and recreation department after 45 years, making him one of the longest-serving municipal public servants in the Montreal suburb. He left to spend more time with his family. Cammy is universally respected and liked by citizens, elected officials and fellow employees alike. They credit him with being a driving force in the development of Côte-St-Luc’s enviable sports and recreation facilities, as well as its top-level competitive and leisure athletic programs. It was an unusual life’s work for a middle-class Jewish boy whose two siblings became educators. He might have followed a similar path, having initially studied history at university, but Cammy was a sports-mad kid. In his 1970 Wagar High School graduation yearbook, he listed his ambition as becoming a professional football player. But given his size, baseball was a more realistic pursuit. It was baseball that brought Cammy, who spent the first 10 years of his life in NDG, to Côte-St-Luc. He played pickup softball there at Wentworth (now Kirwan) Park, which, at the time, was the only sports “facility” in the town, except for an outdoor pool. In 1970, he moved up to the hardball Midget AA Avengers, a team coached by local sports store owner Lenny Goldfarb, and then moved on to coaching. His first paid jobs, starting in 1973, were wading pool attendant, day camp counsellor and outdoor skating rink monitor. When the city decided to turn the makeshift field where they played into what would become Centennial Park, Cammy was among the petitioners for a baseball diamond. The new field was not only home to the inter-city Avengers, but also spawned thriving bantam and peewee programs. Soon, Cammy, who was also a hockey coach at the time, was among those lobbying for an arena for the growing community. A few fears later, in 1977, the Samuel Moskovitch Arena opened. Cammy might not have made his passion a profession if Concordia University had not coincidentally offered the first English-language recreation and leisure studies program in Quebec. Cammy completed a degree in the field and, as luck would have it, there was an opening at the same time in the Côte-St-Luc recreation department. He became the city’s full-time manager of sports in 1978. He worked with five mayors, as well as eight recreation directors, throughout his career. Harold is one of the finest professionals I have ever met. Cammy excelled at organizing sports, as well as sports-themed charity events that rallied armies of volunteers and attracted celebrities from the Montreal Canadiens, Expos and Alouettes. Johnny Elias, who had pitched professionally in the minor leagues in the United States, set up his famous Grand Slam Baseball School in Côte-St-Luc and partnered with Cammy in many high-profile tournaments. Maccabi stalwart Roy Salomon, who was recently selected for the International Jewish Sports Hall of Fame, says Cammy did much to encourage Jewish kids to get involved in sports, including many who later excelled competitively on a larger stage. “He had a tremendous influence,” said Salomon, a standout in the city’s legendary Slo-Pitch Association for two decades. “Harold is one of the finest professionals I have ever met. No matter what the situation, however tough, he always had a smile on his face, he never lost his cool. If he has to pick a highlight, Cammy recalls 1997, when he and former MNA and sportscaster George Springate helped retired Habs great Jean Béliveau reach his goal of donating $1 million to disabled children through a celebrity softball tournament. More recently, in 2005, the Israeli national hockey team, on its first visit to Canada, played at the Moskovitch Arena, attracting a standing-room only crowd. It doesn’t take a great effort to be kind and helpful; it just takes a little empathy, compassion and understanding. Cammy is particularly proud of creating the Pierre Brunet Parks and Recreation Bursary Fund (named for the local McDonald’s franchisee and generous collaborator) with councillor Mike Cohen three years ago. It supports local families with special-needs children or financial problems, enabling them to participate in Côte-St-Luc recreational programs. Cohen credits Cammy with being the architect of what Côte-St-Luc’s parks and recreation department offers today. “Harold was an innovator. He was never satisfied with the status quo, he always went the extra mile,” says Cohen. More importantly, Cohen says that Cammy, whom he has known since he was about 10 years old, is a prince of a human being. “He’s dedicated, caring, he’s always been there to respond, whatever the time of day,” he says. Cammy, who’s lived in Town of Mount Royal since 1979, wanted to step down five years ago, but was persuaded by the city to stay a little longer. He is grateful to his wife of 34 years, Beverly Cammy, for allowing him the freedom to put in so many long days, because she stayed home and looked after their daughter, Lacey, who has special needs. I have known Irwin Kauffman most of my life. He and his family grew up a street away from me in Côte Saint-Luc and we run into each other often. Before we crossed paths last May, I knew Irwin had spent several decades in the garment trade. He told he had stepped away from that career in order to help his son Robert with a business called Chef on Call. Rewind to 2009 when Robert and a friend had a novel idea: prepare meals out of a small kitchen in their student apartment and see if they’d get any customers. The key target market was students. That marked the birth of Chef on Call, now an absolutely thriving business with a storefront location at 3430 Avenue du Parc near McGill University and a delivery system that has gone through the roof. While students have made up the bulk of the clientele, Irwin came aboard to help reach out to the corporate sector and this has been a huge success. Robert’s business partner is Gabriel Malbogat, whom after many calls and e-mails I finally met in person. One of the very novel ideas Chef on Call has launched is their Donator Burger. For every one sold, Chef on Call will donate $2 to a different charity each month. Malbogat says they raised more than $10,000 in 2017. The Donator initiative was first started in 2015 and has since that time it has assisted over 20 different local charities/non-profit organizations. This brings me to the Côte Saint-Luc Cats Committee, which I proudly oversee as part of my city council portfolio for Animal Protection. For the month of February we will be the beneficiary so I urge everyone to drop by Chef on Call before February 28 or make an order if you are in the delivery area. As I sat down to chat with Robert and Irwin, Gabriel made sure I did not leave without sampling this month’s creation: a crispy breaded chicken breast in a delicious bun topped with Monterey Jack cheese, sliced tomatoes, crunchy iceberg lettuce and some pesto mayo. All chicken burgers are served with curly fries. Yes, this Donator burger was an extreme treat to consume. I loved every morsel of it. Even though I felt quite full, I agreed to share this with Irwin. I did not want to insult my old friend. And yes, it was pretty spectacular. I am pleased to say that Diane Liebling, our invaluable and tireless working chair of the CSL Cats Committee, experienced the Donator Burger with her husband Allen and signalled a big thumbs up to me.. The Avenue du Parc storefront is very close to McGill Stadium. They moved here in April 2016. If you want to take advantage of counter service and eat in the restaurant, capacity is 45. This is an upscale version of any fast food spot you have dined, with some of the distinct décor coming from Gary Litwin’s Union Square Vintage Wood at Carré Union on Royalmount. All of the food is made from fresh ingredients in the kitchen, where I saw Chef Raffi hard at work. Delivery orders represent the bread and butter of the operation, with drivers available during the day and 15 to 20 at night. They also now user Uber Eats and Foodora as well. “We are open 18 hours a day Thursday through Saturdays and 16 hours the other days. “Given our student clientele, our busiest period is between 2 and 4 am,” Robert notes. There is a delivery zone map on their website. Chef on Call essentially covers downtown, Westmount, St. Henri, Old Montreal, the Plateau and Mile End. With sufficient notice, large orders can be accommodated elsewhere. The menu includes various hamburgers, chicken burgers, poutines, wraps, hot dogs, pastas, salads and vegetarian options. Milkshakes represent one of their best sellers. They have 30 different flavors. Malbogat is now in serious negotiations to open the second Chef on Call in Waterloo, Ontario. The hope is to make this happen by next summer. From there expansion is envisioned in London and Hamilton. Operating hours are 11 am to 2 am Sundays to Wednesday and 11 am to 4 am Thursday to Saturday. For more information log on to www.chefoncalldelivery.com or call 514-844-2044. I have known Tobie Saragosti for many years, but only when I sat down to speak with him at his Rembrandt Avenue condominium in Côte Saint-Luc’s District 2 did I find out what an interesting path he took to become a professional translator (English to French and French to English). “Learning languages has always been my forte” he says. Tobie was born and raised in Tunisia, where his mother tongue was French. His father was in the clothing industry making uniforms for the police and the army. At the age of 25 Tobie moved to France and then to New York to learn the trade. But in 1974, being a Zionist, he made Aliya after the Six Day War and remained in Israel for six years while operating a stationery store. Life took him to Iran, where he quickly learned the language, and then to Canada where he opened a bakery. Six years later he switched vocation again and dabbled in kitchenware, arts and crafts supplies and ceramics. In Montreal, he met Fran Gutman and the two married in 1989. This is where my connection came in for I worked with Fran at the Canadian Jewish Congress for a decade. She just retired as an administrative assistant to D’Arcy McGee Liberal MNA David Birnbaum. At the age of 60, Tobie decided to go back to school and get his formal degree in translation. He enrolled in the program at the Université de Montréal, attending classes five nights a week and successfully became a certified translator. For more than a decade, Tobie has established a highly respected reputation among his loyal clientele for his translation business. He is known for providing highly accurate translation services. Reliability, Integrity, Efficiency is his motto. Tobie also works as an interpreter at the different municipal courts of Montreal and its surroundings, and is often called to work in cases involving Hebrew, French and English. If you require an excellent translator, you can reach Tobie at 514 733-0715 or 514 817-4194, or by email at saragostitobie@gmail.com. A closeup on the fabulous new CSL Martial Arts dojo at a Quartier Cavendish which is keeping fit! I must say that as the city councillor for District 2 in Côte Saint-Luc, which encompasses the Quartier Cavendish, I am very encouraged by some new developments in recent months. The first shot in the arm was when the Sidel family owned Café de L’Avenue. Soon Emmanuel Darmond will relaunch his food court Deli Boyz . Junior Booty is relocating from the Côte St. Luc Shopping Centre in the early New Year. In the past few days I have been delighted to visit the brand new Idolem Hot Yoga Studio and Stacy Ungar’s CSL Martial Arts Studio or dojo, a training center for martial arts. They are both located along the hallway between the back entrance to the CLSC René Cassin and the main entry way towards Pharmaprix. Of course there is also an Econfitness locale there as well. This is the 12th Idolem location in Quebec. Franchise owner Melody Benhamou also owns a locale on St. Denis Street, with another to come in St. Laurent. Hot yoga refers to yoga exercises performed under hot and humid conditions. Their new studio was nice and toasty to visit on a recent frigid Montreal day. CSL Martial Arts teaches the arts of Shotokan Karate, Fitness Kickboxing, Tai Chi, and Qigong. Karate and kickboxing classes are taught by Sensei (teacher in Japanese) Ungar, a certified fifth dan JKA (Japan Karate Association) instructor. Tai Chi and Qigong classes are taught by Master Ted Constant. Children, adults and seniors are welcome to come and train via a free trial. The new dojo studio was conceived, supervised and built by Navedco Construction Inc. This is a CSL-based company that specializes in commercial and retail construction. “We were very happy to assist Stacy in his venture to branch off on his own outside of West-End Gym,” said Vice-President Brandee Adler, who runs the operation with her husband Jocelyn Dagenais. “Stacy is a great guy and our daughter Aidyn adores him – she’ll likely be doing karate her whole life thanks to his awesome way of teaching & of getting the kids to always try to better themselves! “Even though this was a small project for us, it was nice to finally get the opportunity to work in our own neighborhood. It was so encouraging to see so many happy faces when they saw the new dojo! Everyone thinks the space is so cool, and they all especially love the Shotokan tiger logo on the wall, which is now a sort of ‘backdrop’ for Stacy while he teaches. The mall administration loves it as well, especially the window that allows passers-by to peek in and watch the classes." There are in fact three constituents of mine from District 2, 11 year olds performing at a very high level via the dojo: Aidyn Dagenais-Adler, Jayden Blitzer and David Ihaza. The three friends were all seven years old when they decided to give martial arts a shot. They tried one of Stacy’s classes and were hooked! I sat down with Aidyn last week. The Grade 6 Royal Vale School student loves learning the martial arts. “I would like to make it to the Olympics one day,” she said. Of Aidyn, Jayden and David, Stacy says the key to their success is having started young. “I am very proud of all of my students,” he says. Jayden, David and Aidyn display their medals. On Sunday, December 17 there was an Inner Dojo Competition. Aidyn took gold in all three categories for her age and level. She won the gold in kata while David and Jayden took the silver and bronze respectively. Aidyn also won gold in girls kumite (only two girls competing in free sparring) and David captured the gold in boys free sparring. The team of Aidyn, David and Jayden won the gold in the team kata, brown/black category. Stacy’s dojo had the largest delegation of all of the Team Canada competitors at last summer’s World Gichin Funikochi Cup at the University of Limerick in Ireland. Aidyn finished in the top 16 in the world. Had she not had her second elimination match against the young Japanese competitor who took the gold, she would have moved into the top eight as her performance was reportedly outstanding. Aidyn will be 12 years old in December, and has already made her mark in the city, winning medals at every competition she goes to, and took gold at nationals last May. She is right now at the first brown belt level (called ‘3rd kyu’). She and her two friends passed their 2nd kyu exam recently. That puts them one level away from their first dan black belt exam, which it is hoped they can achieve by age 13. For more information call Call 514-708-7839. District 2 resident Stanley Diamond is one interesting gentleman. I have known him for many decades. “Squeezing what I would have liked to say into the 15 minutes I was allotted and still include references to my shul history was a real challenge,” Stanley told me. “I obviously had to take liberties and do a lot of paraphrasing and collapse so many parts of the JRI-Poland history into single sentences." "Shaareing" a moment with Stanley Diamond. Stanley is the executive director of JRI- Poland. Holocaust survivors and their families, as well as pre-war Jewish immigrants from Poland and their descendants, may be unaware that a remarkable number of Jewish records of Poland have survived the upheavals of history and the ravages of war. Jewish Records Indexing - Poland (JRI-Poland) has created indices/extractions to more than 5 million Jewish birth, marriage and death records from current and former territories of Poland that are housed in that country today. Indices/extractions to vital records more than 100-years old are searchable on the JRI-Poland online database. JRI-Poland can also direct researchers to detailed information on how to find records less than 100-years old from specific towns now in Poland and in the Lviv, Ternopil or Ivano Frankivsk districts of Ukraine. In addition to vital records, the JRI-Poland online database includes other types of records such as Books of Residents, censuses, army draft lists, school records, cemetery burials, Polish passports, ghetto death records, birth, marriage and death announcements in Polish newspapers and post-war court and legal announcements in official newspapers (Monitor Polski). The data varies widely by town or region. Here is a transcript of Stanley’s speech as he “Shaared” his story. Thank you Rabbi for your generous introduction and for giving me the opportunity to “Shaare” my story. It’s truly humbling to be honored by my synagogue where 71-years ago this week, I celebrated my bar mitzvah. It was September 1946 and 28-year old Rabbi Maurice Cohen was our new Rabbi… and I was privileged to be his second bar mitzvah. After I finished my haftorah, Rabbi Cohen asked me to stand next to the pulpit, where he addressed his sermon directly to me. I’ve never forgotten the theme of his words…simply “your destiny is in your hands…don’t be a fatalist.” I hope my path through life reflects that advice…but that’s for others to judge, not me. My life has been touched by the Shaare Zion in countless ways. My first memories go back to Simchas Torah in our Claremont Avenue shul that burned to the ground on February 12th 1939. I’ll never forget my mother’s tears when she heard the sad news. I remember our temporary synagogue in a house on Cote St. Antoine Road and then, starting cheder when the first part of this shul opened in 1941. This synagogue is where my three siblings and I married, where my daughters Paula, Rachel and Jessika were bat mitzvoth, and where Paula married. This is the shul where my mother was sisterhood secretary for decades and where my siblings and I helped her with the sisterhood’s annual fundraising bazar. I sit in the same seat on the aisle where my late brother Arthur sat before me and where my late father Harry sat before him. My father always sat on the aisle, at baseball games, hockey games, movies and of course, in shul. And in keeping with his tradition, you will find my father – on the aisle - in the Shaare Zion cemetery. Many years ago, my wife Ruth remarked, “what are you going to do when you retire?” Other women in this sanctuary may have asked a similar question - if they witnessed what Ruth endured for many years…a husband who had a passion for his international decorative ceiling business…and was consumed with it almost every waking hour. Little did I know that the seeds for my post-retirement had already been sown back in 1977 when my nephew Mark Diamond was diagnosed as being a carrier of the beta thalassemia genetic trait, and blood tests revealed that my father Harry, all four of his children and 9 of 13 grandchildren were also carriers. I could hardly have anticipated how being a carrier, the fall of the Iron Curtain and the opening up of the Polish archives…the growth of the Internet and the dramatic changes in communications made possible by personal computers and email…and my international business experience - all seemingly unrelated - would come together to play such a huge role in my second career…a new chapter in my life that blossomed into something far bigger than I could have ever imagined. My family does not suffer from the Thalassemia disease…but we carry the beta thalassemia genetic trait. Only children who inherit the trait from both parents can have the disease known as Thalassemia Major. Children who only inherit the gene from one parent - like the members of my family - live normal lives. Dr. Arthur Cooperberg, head of hematology at the Jewish General was fascinated to learn about our family as he had only seen the trait in Greeks and Italians in Montreal. Cooperberg’s 1977 study of our family revealed that my father was the carrier…as were the families of his sister Ray Steinhouse and brother Barney Diamond. Many of us had been misdiagnosed over the years as being anemic and had been prescribed massive doses of iron which are totally ineffective. But where did it come from? We were naturally curious about the source of the trait…and we knew the potential danger to future generations as well as relatives near and far who were likely unaware that their mild chronic anemia could be something else. But, we knew little if anything about genealogical research and no one bothered to learn. In 1991, I became both the family genealogist and beta thalassemia detective. But to build a family tree of carriers, I first had to discover if it was my father’s father or father’s mother who had passed the trait to him. This was a challenge because my grandparents came to Montreal from New York in 1898 and left their siblings’ families behind. Fortunately, my sole living aunt finally remembered a distant cousin in Florida, a descendant of my grandmother’s brother Aron Hersz WIDELEC. After identifying myself and discussing how we’re related, I hesitatingly asked, "Is there any incidence of anemia in your branch?" "Oh, you mean beta thalassemia, it's all over our family!" In that one moment I knew I had to concentrate my research on my father’s mother’s branch from the town of Ostrów Mazowiecka – halfway between Warsaw and Białystok. My luck continued when I learned about Michael Richman, a remarkable young lawyer in Washington who also has roots in my ancestral town. Using the Mormon microfilms of the 1808 to 1863 Jewish records of the town, Michael not only documented the early generations of his own early family but out of curiosity, two hundred other families – including my grandmother’s WIDELEC family. Within a year, after hundreds of phone calls and countless letters, I had connected the main branches of the WIDELEC family in the United States to the earlier generations in Poland documented by Michael. But to research the other branches of my family from Poland, I needed access to the post-1863 records in the Polish State Archives and the pre-war records in the city hall archives. In May 1994, it was bashert that the keynote speaker at the International Conference on Jewish Genealogy in Jerusalem was Jerzy Skowronek, Director-General of the Polish State Archives. Skowronek immediately grasped my humanitarian quest and offered his full cooperation. Eighteen months later I made my first visit to Poland. But before leaving, I sent letters to a fourteen genealogists with an interest in my town and nearby towns. I suggested we do joint research of the microfilmed records and avoid senseless duplication of effort. The reaction to the letter was swift and just months later, in the spring of 1995, it led to the birth of Jewish Records Indexing-Poland in its early, rudimentary form. With the support of our fellow genealogists, Michael and I organized an indexing project of our town’s records. With the invaluable help of a researcher in Warsaw, index pages from the record books were copied and data entry started…even before we arrived. Three months later, I returned to Poland and handed a thick printed copy of the index to Director Skowronek. He reacted with enthusiasm, so much so that I impulsively asked “wouldn’t it be wonderful if we could do this for all the Jewish Records of Poland?” That moment changed my life and, I am proud to say, ultimately the lives of countless others. One year later, following a trial period during which we raised funds to index four more towns, we signed a long-term agreement to index all the Jewish vital records of Poland. As our database grew – and it now has more than 5 million records – the success stories have become endless. But few match the story of Eli Oren in Israel who discovered a half-brother he never knew existed…living just 20 km away. Imagine also what it has meant to countless others, children of Holocaust Survivors, growing up without any relatives and then finding that family members did survive…and suddenly they have scores of new cousins. In 2013, there was also an historic decision by the Polish State Archive to scan the vital records of all denominations in their thirty (30) branches…and make them freely available on the Internet. JRI-Poland volunteers then started creating internal links in our database to connect the search results to the record images. Who could have forecasted the astonishing evolution - from first learning that records actually survived to now seeing record images online; it’s difficult to imagine that it all happened in just one generation. I’ve already mentioned anecdotal success stories but as testimony to the broader impact of the JRI-Poland database, it’s satisfying to note that are more than one million searches of the data each year. While originally foreseen as a genealogical research source, the database is being used by families looking for links to relatives caught up in the Holocaust, by academics using the data in never-anticipated ways, by individuals needing a father’s birth record to apply for a Polish passport to give them entrée into the European Community. And we are repeatedly contacted by search companies, government departments and lawyers working on inheritance cases. We have helped researchers learn their original family names or locate a record of an ancestor whose Hebrew name was then given to a new-born baby in the family. We did that for Adam Atlas, right here in Montreal…not once, but twice. And of course, there are the countless survivors who trimmed years off their ages when they arrived in their new countries…and who many years later, needed our help to prove their real age and collect retirement benefits. Our database has more than 200,000 burial entries making it possible for many people to visit graves of ancestors, an impossible dream until now. We’re collaborating with the United State Holocaust Museum in Washington, Beit Hatfutot the Museum of the Diaspora in Tel Aviv, and the new Museum of the History of Polish Jews in Warsaw. For Yad Vashem, our records are a source of information about countless victims whose existence is clearly evidenced by our data but whose fates are unknown. Last year we helped a woman in France with records proving that her maternal line is Jewish so that she could get married in a Jewish ceremony in Israel. And, of course, I can’t omit mentioning that JRI-Poland has contributed invaluable research for two TV series “Finding Your Roots” and “Who Do We Think We Are” about famous personalities like Gwyneth Paltrow, Carole King, and Alan Dershowitz. In the end, my greatest satisfaction has been in building an international team. Our executive committee and board are made up of volunteers from five countries. They are all very gratified that their personal interest in family history ultimately led to becoming experts and teachers… Each has made a difference in the lives of others. While our leadership is proud of what has already been accomplished, we accept the responsibility to not only continue our journey, but to ensure that our mission will endure for many generations to come. We’ve been asked why we and so many other volunteers became so deeply involved with JRI-Poland. We believe it’s our passion for what we see as a sacred mission… and the joy that we know we bring others as we ourselves benefit from our combined efforts. The successes that unfold each day give us great satisfaction. What more could I want in these golden years of my life. And that brings me to a tongue-in-cheek question Rabbi Cohen posed after one of my early trips to Poland. We were having breakfast following morning services and after describing what I had been doing in Poland, this erudite gentlemen…with a distinguished Bostonian accent… leaned forward and with a big smile said, “Stanley, from this you make a living!” (Said with a Yiddish accent!) Perhaps not…but I am certainly having a wonderful time spending my kids’ inheritance! When I graduated from the Shaare Zion Hebrew School in 1949, Rabbi Cohen wrote a brief speech for each of the graduates. I would like to close with the words of the speech he wrote for me. It said “Albert Einstein was once asked to prepare a brief statement outlining his philosophy of life. The great scientist wrote a credo in which the initial sentence said “Man is here for the sake of others.” Which brings me back to what Jerzy Skowronek, the then director of the Polish State Archives commented after I told him of the remarkable growth of the JRI-Poland database. “Mr. Diamond, he said, I think G/d gave you the beta thalassemia trait for a reason.” Who am I not to believe those words? Back in 1960, two young Montrealers met on a baseball diamond in the Adirondacks when their summer camps came together to compete and that chance encounter evolved into a lifelong friendship chiefly centred on what some people say is the smartest card game ever invented — bridge. Nearly six decades later, the pair runs Canada’s largest bridge club right in the heart of Côte-St-Luc on the fourth floor of the Quartier Cavendish and that bridge club, named Shakespeare’s Elbow, recently turned 21 years old. All 196 seats may still be filled on a busier day in warmer months and reservations are recommended, but attendance plummets in the winter when snowbirds fly south. In recent years, interest has waned and an increasing number of seats left empty as people move on to other games or to the grave. Players in their fifties are considered “young bloods” and one woman just turned 100. Shakespeare’s Elbow has trimmed back from seven days a week to six and evening matches are a thing of the past. However, Efraim, 72, and Zelnicker, 85, keep plugging away with hopes that younger generations in the area will take up the game and interest will grow strong once again. Back in the 1950s, immigrants brought bridge to Quebec and, by the 60s and 70s, Montreal became a hotbed for the game. Those immigrants passed the game down to their children, like Efraim, who learned how to play from his parents. While some people play for money, that’s not the case at Shakespeare’s Elbow. Competing in teams of two, most players’ goals are to amass points. Some play tournaments, vying for American Contract Bridge League master points with hopes of achieving the rank of life master like Efraim, who competes globally. At Shakespeare’s Elbow, players pay $14 to play three-hour rounds. A catered lunch is included. Instead, he explained, it’s something he does as a way to pass the time in his retirement. It’s more of a public service, he explains, and it’s a service he enjoys. Efraim was a teenage sleepaway camper summering in northern New York when he first met Zelnicker, who was a councillor at the opposing camp’s baseball team. By the late 60s, the two, both from Montreal’s west end, ended up working together at Camp Pembina in St-Donat. Zelnicker was head councillor there and he was developing an interest bridge. He heard Efraim, a councillor, was already an experienced player and he invited him to play with fellow staffers. Once back in Montreal, they played when they could, but life got in the way of their hobby. Zelnicker went into the men’s fashion industry and Efraim became an engineer. They had spouses, children and busy jobs. Efraim started a construction firm and Zelnicker travelled throughout North America to sell clothes. They stayed friends over the years, but it wasn’t until the mid-80s when they started getting serious about bridge again, playing at local clubs. One of the first people through the door was Barbara Bernstein, a newbie that was immediately hooked. Now she plays six days a week, her passion for bridge unwavering. Allow me to introduce you to Côte Saint-Luc District 2 resident Bruce Takefman, the president of Research Consultants International FDI, Inc.
WAVTEQ Limited has made an equity investment in Bruce's company in order to create the world’s largest Lead Generation Group with a global team of 75 lead generation consultants. The partnership between two of the fastest growing companies in the industry combines WAVTEQ’s pan-Asia and pan-Europe lead generation teams with Research Consultants International North and South America teams. The new group will provide a seamless service to Bruce's economic development clients allowing them to target all the major source countries worldwide for inward investment. According to Dr Henry Loewendahl, Group CEO of WAVTEQ, “We are incredibly excited about bringing Research Consultants International FDI Inc. into our Lead Generation Group. The combination of Research Consultants International's large and rapidly growing consulting team in North and South America with our Asia and Europe companies will provide economic development organizations with genuine global delivery capability for the first time. Research Consultants International FDI Inc. have a fantastic track record and reputation in the market and we look forward to working together to deliver more investment for our clients. According to Bruce, “We could not be more thrilled to create the first truly worldwide FDI consultancy alongside Dr. Loewendahl and the WAVTEQ team. Our clients from North America will have access to global investment projects from all over the world and have access to the top business intelligence products in the market today including fdi365, FDI Professionals, FDI Accounting and IncentivesMonitor. Our new global consortium will allow our clients the ability to actively recruit all over the world and access to valuable international business intelligence”. WAVTEQ (booth 616) and Research Consultants International FDI, Inc (booth 501/503) will be exhibiting at the upcoming International Economic Development Council's (IEDC's) Annual Conference in Toronto, September 17-20, 2017. Bruce established his company in 2010. The firm currently employs 20 full-time professionals and is headquartered in downtown Montreal while maintaining offices and key strategic partnerships in numerous locations including Toronto, St. John’s, New York, Silicon Valley, and Santiago, Chile. The firm provides business intelligence, market research and executive meeting and matchmaking services. It has helped to generate over $3 billion in new foreign direct investment for its client base. In June of 2017, the firm launched its proprietary fdi365, a customized online business intelligence platform designed for investment attraction and economic development professionals. A few months before I launched my first campaign for city council in Côte Saint-Luc in 2005, I was eating at Dunn’s Famous downtown and talking to owner Elliot Kligman. The topic of the election came up and when I told Elliot that my District 2 encompassed Marc Chagall Avenue, he excitedly told me that his parents Mel and Bayla resided in a condominium on that street and I should call his mom. I did indeed give Bayla Kligman a call and she was beyond supportive. “How can I help?” she asked. One night Bayla invited me to the building and proceeded to introduce me to all of her neighbours. I never forgot her good nature and I was deeply saddened upon learning last summer that she had passed away. Bayla was the daughter of Myer Dunn, the founder of the restaurant that bears his name. On Thursday, August 10 the Israel Cancer Research Fund (ICRF) will hold its 15th annual Ladies Only Golf Tournament at Hillsdale Golf and Country Club in Bayla’s memory. Bayla, with daughters Elisa and Robin. Bayla also loved golfing with her three grandsons, “the boys,” while enjoying the friendly competition and laughs between them. Sundays were reserved for couples’ golf where she partnered with her husband Mel. ICRF Montreal Executive Director Gail Grief says that at each event planning meeting, new “Bayla isms,” are suggested – noted quotes from Bayla. There will be one placed at every hole. Some of them include: « A room with a view »; « A Kodak moment » ;« My boys »; « 100 % »; « A beauty, a doll »; « It’s always the one who asks’; « Grow teeth »; « Get legs »; « I bring out the best in you »; « Be good to Bayla »; « Never up, never in »; « I give you the first putt »; « A chip and a coke » ; « Higher Myer »; « Hit the ball, Nelly »; « The tears are dripping down my legs »; « It’s not how you drive, it’s how you arrive ! ». How clever! Bayla will indeed be looking over each hole. The Ladies Only Golf Tournament remains an important source of revenue for ICRF. This year the Kligman family have stepped up to the plate, along with countless volunteers. Sponsorship is still being accepted. Founded in 1975, ICRF has raised approximately $60 million and supported over 2,300 research projects. ICRF-funded scientists have been at the forefront of important discoveries such as GLEEVEC, DOXIL, and VELCADE, which today, are used to treat hundreds of thousands of cancer patients across the globe. Montreal is an integral branch of the ICRF family, which also has offices in New York, Los Angeles, Florida, Chicago, Connecticut, Toronto and Israel. For more information, please contact Gail Grief, ICRF Executive Director (514-481-2723, gailgrief@icrfmontreal.org).